COLOR(S):Black, white, reddish brown, red. Like its name suggests, a Boxerdoodle is a cross between the Boxer breed and Poodle breed. These hybrid dogs may display any combination of traits from their two parenting breeds. One direct benefit of this hybrid, is the nonshedding coat that adapts from the original Poodle. For this reason, Poodles have become increasing popular in the recent rising trend of crossbreeding dogs. 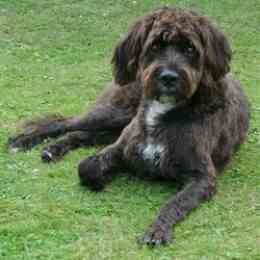 deally, Boxerdoodles will be loving, loyal and affectionate as pets. They have happy dispositions and playful attitudes. This cheerful breed does best in a home with older, considerate children. While Boxerdoodles are not recommended for homes with other pets, if these dogs are raised alongside other dogs and cats, they can get along with them. They make capable watch dogs who will alert the family to visitors or unusual sounds. Depending on the type of coat displayed by the Boxerdoodle, regular brushing is required as well as professional clipping. This breed should only be bathed when necessary with a mild shampoo. Boxerdoodles may be prone to health concerns including epilepsy, skin problems, hip dysplasia, allergies or PRA. If sufficiently exercised, Boxerdoodles will do okay with apartment living. These dogs are highly energetic and need to be walked on leash daily, have the opportunity to join family play sessions or run off the lead in a securely fenced in yard. It is recommended that Boxerdoodles are socialized beginning at an early age. They can be stubborn or sensitive and should undergo obedience training. They will not respond well to heavy-handed or harsh training methods. Instead, training should be done firmly yet fairly and with patience and consistency.